Ball pythons are not terribly active snakes, so a smaller enclosure is fine (10-20 gallon tank for younger snakes, 30 gallon tank for an adult). However, they are adept escape artists, so a securely fitted top is an absolutely necessary. Substrate: shredded bark, newsprint, Astroturf. Astroturf is probably the easiest - cut a few pieces to fit the cage, and simply replace the dirty pieces as necessary (the soiled pieces can be soaked in a solution of one gallon of water with 2 tablespoons of bleach, rinsed well, dried and then used again). Furnishings: provide sturdy branches and a dark hiding place (they like to feel securely enclosed, so it should be just large enough to accommodate the snake). Temperature: 80 - 85 F (27 - 29 C) during the day, with a basking spot of around 90 F (32 C). Night time temperatures can fall to around 75 F (23 -24 C) as long as an area of 80 F is maintained. An under the tank heating pad designed for reptiles works well for providing the cage heat, with an incandescent bulb or ceramic heating element used to provide the basking temperatures. Never use hot rocks, and the bulb or heat element should be placed or screened off to prevent contact with the snake or burns may result. Use multiple thermometers to monitor the temperatures in the cage (one at the bottom of the cage and one at the basking spot). Lighting: Ball Pythons are nocturnal, so have no special lighting requirements. However, they are nocturnal, so incandescent bulbs should not be used at night (to preserve the light/dark cycle the snake needs) - instead use red, blue or black bulbs. Water and Humidity: provide a dish large enough for the snake to soak in. Soaking is especially important during sheds. Some owners like to provide a covered dish (e.g. plastic storage container) with a hole in the lid, to provide security for the snake so it will soak longer if necessary. Another alternative is to provide a humidity retreat, which similarly uses a covered container with an access hole lined with damp sphagnum moss to provide the moisture (a water dish is still provided outside the retreat). 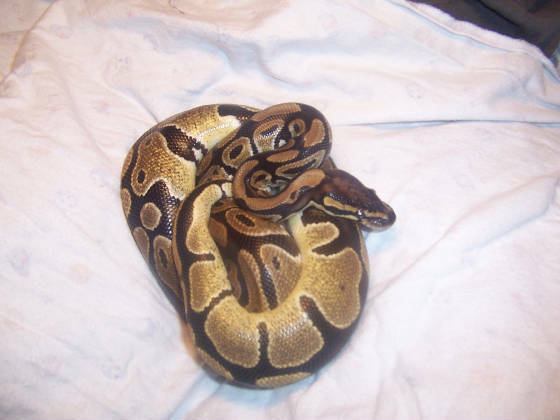 Ball pythons can be fed exclusively mice or small to medium sized rats (as appropriate for the size of the snake), and only need to be fed every week or two. Young snakes should be fed fuzzy mice every 5-7 days, older snakes should be fed increasingly larger prey and can go a little longer (i.e. 10 - 14 days). Use pre-killed prey as live mice can injure a snake - dangling the prey in front of the snake with forceps usually gets the snake interested. Moving the snake out of its cage into a separate enclosure for feeding is a good idea and will help in the taming process. The snake will associate eating with the other enclosure, and is less likely to confuse your hand for prey when you put your hand into the cage. This will make it easier to reach into the cage to get the ball python out for handling. Even captive bred ball pythons sometimes refuse to eat, fasting for a couple of months. As long as body weight and condition are maintained, this is not problematic. If your snake stops eating, carefully examine the husbandry, handling, health, and environment of the snake to make sure stress isn't the culprit. Consult a knowledgeable vet or experienced keeper for help if the fast is prolonged or causing weight loss. If necessary, some tricks to entice a python to eat include dipping the prey in chicken broth, trying different colors of mice, exposing the brain of the prey before feeding it, feeding at night, covering the cage with towels after offering a mouse. You may even want to try feeding a hamster or gerbil, although this may make your snake more likely to refuse mice if it develops a preference for hamsters and gerbils.